Clearly marks you as Northern English… Rare to hear such words. Keep it coming, @Costas. Ignoramus Mohan wants to know how you tested the touch sensor. What additional hardware did you use? How many pins are touch sensor enabled? I believe there are 10 pins capable for the touch sensor routine. 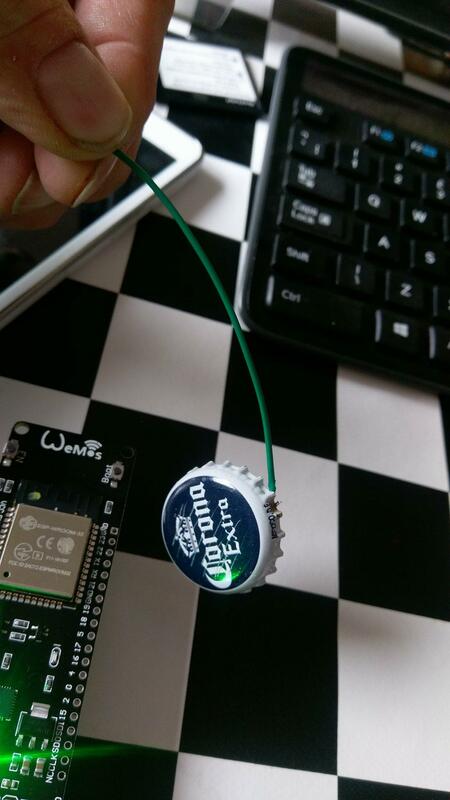 No additional hardware, I just soldered wires to the edges of two beer bottle tops and used them as touch pads. True… but required more pins and a voltage divider for a single touch sensor. @Shadeyman here you can find some sketches to play with. Isn’t 61.7 ºC a bit high when running idle? Room temp is 22ºC so its about 40ºC above ambient. 60ºC is hot to touch, even though it says 61.7ºC it doesn’t feel hot, so the temp sensor must be deep inside the cores. Plus its not exactly at idle, its running a simple code and sending the resulting data over WiFi. At least his is probably closer to reality… mine runs around 45-51°C but the value I get is about 91-97. So after confirming with an external temp probe, I ‘calibrate’ it by subtracting 46 from the sensor reading. Now every time I use the external probe to double check… it is spot on. Now the little voltage regulator beside it… that can get very hot… too hot to touch even with a little heatsink… mind you I am using it to power an ESP-01 on the same breadboard as well Going to switch that duty to a seperate regulator soon. Give it something to do, see is it increases? Yeh, even at 51 year old I’m still “living life on the edge”. Celcius calculation looks the same in your code. The ESP32 is a powerful chip compared to Arduino so perhaps our small code is not enough to get it any hotter? 61.7C ? Are you inside a volcano? afaik those internal sensors are crap, they should be used for trend monitoring, not for measuring absolute values. Messed with the code and managed to re-calibrate the temp sensors so they’re a bit more realistic. I think(was tired) I read last night that this is a factory calibration issue which Espressif plan to solve later this year, something to do with internal voltages. I’ll try and link to it if I can find it again.